1 bedroom. Kitchen/diner, separate lounge. Private garden & parking. Just 55 mins from London, this is a perfect retreat and just 2 minutes from the beach! Located in the coastal village of Sandgate, our home has a private patio garden to the front and allocated off-road parking. 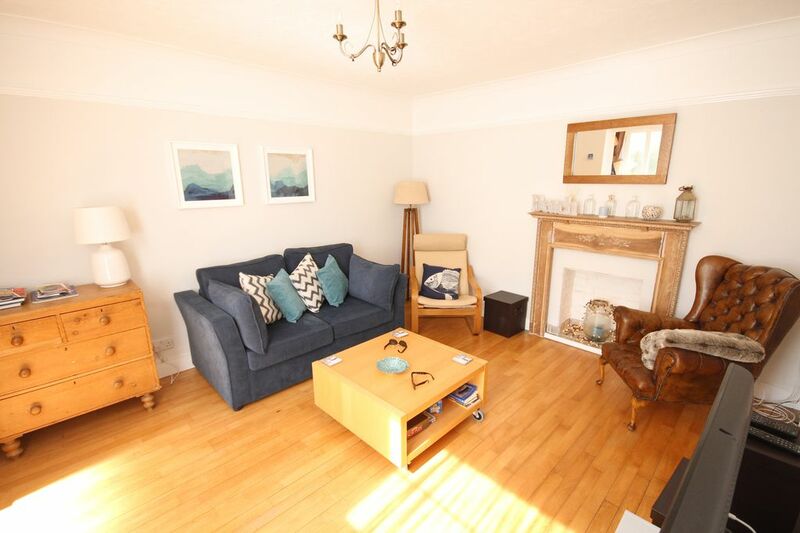 This is a lovely garden flat on the ground floor of a 4-storey building built in the 1800’s and offers approx. 54sqm / 577 sq ft of space. It has a cosy cottage feel about it with sole use of the gated front patio garden with private access from both the front and rear of the building. The front entrance porch has practical space for shoes and coats and leads to a generous lounge, complete with 2-seater sofa-bed and 2 armchairs. The sofa-bed includes a comfortable small double memory foam mattress (4ft x 6ft). The lounge is a light and airy room with solid wood flooring that suits the charm and the character of the building. We have a flat screen TV with Freeview, Chromecast, Sonos and Wi-Fi internet access plus a varied selection of DVDs and books. Through the door to the kitchen and dining area you will find the kitchen is well equipped with a brand new electric oven and gas hob along with fridge & freezer, microwave oven and washer dryer and cupboards packed with plenty of pots, pans, crockery & glassware, cutlery & utensils. All that you might need for a short or long stay. There is seating for 4 and an extending table. The inner hallway leads to the bathroom and bedroom and there is also rear access to patio and parking. The bathroom is modern and spacious and consists of WC, basin and a generous sized walk-in shower. We will provide bath towels for your stay and we also keep a supply of shampoo, conditioner and shower gels available which you are welcome to use. The bedroom was re-decorated and a new carpet fitted in early 2018. It's a quiet space to the rear of the building with a double bed with the most comfortable memory foam & spring combo mattress. Perfect for restful sleep. There’s also a chair & side table, wardrobe and chest of drawers. The bed will be made up ready for your arrival. This is an ideal retreat for couples, but the sofa bed allows for friends or a small family. It’s perfect as a base to visit the many attractions around Kent and surrounding areas. Guests with children or with mobility issues should be aware that there are 8 quite steep steps down to the road from the front patio garden and a further 8 to the rear. There is currently a handrail to assist at the front only. Local amenities include a village store/post office and various pubs, restaurants, tearooms and various shops all within meters of the property. The village of Sandgate fringes the English Channel and spans 2.5 kms of Kent coastline between Folkestone and Hythe. It's just a few minutes from both towns by car or bus or a flat seafront walk or cycle ride. You'll find beaches with long views over the Channel. There are plenty of places to visit including Folkestone's Lower Leas Coastal Park, the "World Famous" Romney, Hythe & Dymchurch miniature railway, Dover Castle, Canterbury Cathedral, Port Lympne Wild Animal Park and many more wonderful spots throughout the Kent countryside or if you prefer you can jump on a ferry and head to France for the day. We are happy to accept 1 small, well-behaved dog at a charge of £25 per stay for additional cleaning. To save any embarrassment, please do not ask about any dogs that are not a small breed. We have an agreement with our neighbours and are unable to offer accommodation for any dog that does not fit this description. Having grown up in the area, Sandgate holds such happy childhood memories for me. I now live and work in Greater London, so this is the perfect escape for my husband and I. The apartment is in a lovely location within walking distance to the shops, cafes, bars & restaurants of Sandgate and just a couple of minutes from the beach. It's also a good walk from here to Folkestone and we can reward ourselves with a bite to eat and drink at the Harbour Arm. The apartment is a great spot to use as a base. We visit all over Kent from here and come back to our little haven by the sea. Our home has it's own front and rear entrance which gives the feeling of a cottage more than an apartment. Having our own off-street parking is a huge benefit during summer. There are bus stops very close to the property, so you come without a car you can still easily venture further afield by bus. The apartment also has it's own little patio garden to the front with table and chairs, perfect for enjoying a chilled glass of wine at the end of a summer's day. The location is fabulous just across the road to the beach. There's nothing quite like a coastal walk whether first thing in the morning or last thing at night. Bedding will be provided for number of guests booked. Bath towels only. Not beach towels. We supply fresh milk, bread, butter and fruit juice for your arrival. Currently a couple of board games and a pack of cards. We provide a welcome pack consisting of fresh milk, bread, butter and juice along with pantry goods such as tea-bags, instant coffee, condiments. The bathroom is stocked with some toiletries and a couple of rolls of toilet paper. Good location, Sandgate is a lovely little seaside town, lots of character and not at all commercialised. The apartment was clean, decoration modern and it was very well stocked with extras such as DVD’s. Good communication with the owner and our little dog was made very welcome with a bed, blanket and treats. Lots to do and explore nearby. Lovely, homely flat in pretty little town. Unspoiled and relaxed place, great walks for miles in both directions along the seafront. Lots of thoughtful little extras in the flat and first class service from the owners. Highly recommended. Ideally situated property for exploring the beautiful Kent coast. A really comfortable, clean apartment with everything you need for a home from home, We thoroughly enjoyed our stay and hope to return one day. An excellent home from home. Ideal for a couple. It's clear a lot of care and thought has gone into the interior decoration of the flat making it both stylish and very comfortable. Good location too. The small patio garden at the front is ideal for breakfast or lunch outside, and early evening aperatives! We were lucky enough to get great weather! Our little dog was made very welcome too - with bowls, treats and even a bed for her. The parking space is a big bonus as public parking is limited in Sandgate. Sandgate has an excellent choice of cafes, restaurants, pubs and takeaways too, and is ideally situated, walkable to both, between Folkestone and Hythe. We will return. We really enjoyed our stay - our first holiday away with our toddler. We fitted the travel cot in the room with us and the bed was the most comfortable I’ve ever stayed in when on holiday, the towels were soft, and the shower was large so we fitted a laundry basket in to bath him in the evening. Sometimes we could hear the people upstairs in the evening, but I think that’s what you get for staying in a beautiful character filled flat in an old property, and going to bed quite early after an exhausting day exploring with a toddler. It was really handy having a parking space so near and all the information given to us by the owner was very clear and helpful. Please contact me for last minute deals.